Lock in a great price for Element Kuala Lumpur by Westin – rated 9 by recent guests! Breakfast and view from the room where both excellent. Room was clean and really big. The guy at the concierge on the ground level was extremely helpful in helping us find cabs around the city. The room was spotlessly clean, excellent bath, lighting, everything was up to high standards. The staff were friendly and professional, Good buffet breakfast. The hotel rooms are on the upper floors and I had a great view of the city. The pool is nice and also has great views. Many restaurants and shops within a short walk. One of the best hotels for the price I have stayed in. The location’s proximity, the helpful staff and the spacious clean room. I was looking at many 5 star hotels in KL and it was a very hard choice for me, but i'm really happy that i end up choosing Element. First of all hotel is very new, which is great. The view from the room was amazing, the rooms were very clean. Bed was heavly soft and comfortable,you can sleep in it forever. The rooms are quiet and you can take a great rest. Wifi was very fast all over the hotel. Staff was very helpful, and they were happy to help with any request we had. The hotel accomodated our request for early check in, and late check out. We had room with the breakfast, food choice was great. It included a wide range of different cuisines and fresh fruits and juices. The location is PERFECT. Its 1 min walk to the metro. And it has a small supermarket at the ground floor, if you wanna buy some snacks. Honestly, the hotel is much better than some 5 star hotels in KL. Keep up the great work! I like the beds, Westin style bed very comfortable and clean. Every thing was wonderful for me and the family (I was with three kids 12,9 and 4) having a washing machine for me was amazing. The check out was extended until 2:00 pm as our flight was at 7:00 pm. That was wonderful. 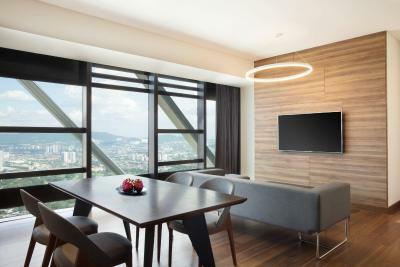 Element Kuala Lumpur by Westin This rating is a reflection of how the property compares to the industry standard when it comes to price, facilities and services available. It's based on a self-evaluation by the property. Use this rating to help choose your stay! One of our top picks in Kuala Lumpur.Nestled in the heart of metropolitan Kuala Lumpur, Element Kuala Lumpur by Westin stands at 825 feet high and is the tallest eco-friendly hotel in Malaysia. 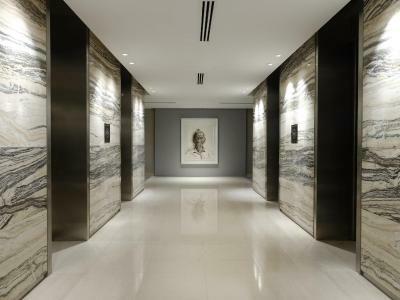 Designed by Foster + Partners, it offers sophisticated accommodations just 2,650 feet from Petronas Twin Towers, and features breathtaking views of the Kuala Lumpur city skyline. Guests at this nonsmoking aparthotel can indulge in a relaxing spa session or enjoy a quick dip in the luxurious indoor swimming pool. Free WiFi is provided in all areas. The accommodations features stylish interior design with neutral palettes. It comes with a flat-screen TV, work desk and a night stand. The marble bathroom comes with a heated shower and/or bath. Complimentary toiletries, towels and a hairdryer are provided for your convenience. You can choose to break a sweat at the fitness facility on the property, or rent bicycles for free. Multi-lingual staff are available to assist you with inquiries. Element Kuala Lumpur by Westin's on-site restaurant offers an array of healthy delicacies, while the in-house bar serves a hefty menu of drinks. The area is popular for cycling. Suria KLCC and Aquaria KLCC are within 2,650 feet from Element Kuala Lumpur by Westin, while Starhill Gallery is 0.9 mi away. The nearest airport is Sultan Abdul Aziz Shah Airport, 12 mi from the property. 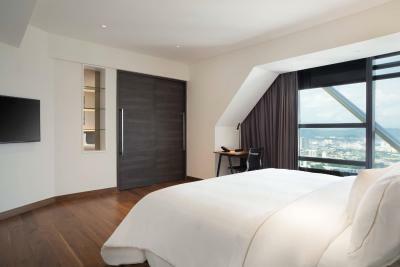 When would you like to stay at Element Kuala Lumpur by Westin? This twin room features a electric kettle, air conditioning and microwave. This double room has a electric kettle, flat-screen TV and microwave. This twin room features air conditioning, satellite TV and view. This suite has a kitchenware, air conditioning and electric kettle. This suite features a stovetop, microwave and flat-screen TV. This suite has a toaster, dishwasher and satellite TV. This suite features a electric kettle, air conditioning and dining area. This suite has air conditioning, sofa and washing machine. This suite features a view, dining area and satellite TV. This suite has a kitchenware, air conditioning and dining area. House Rules Element Kuala Lumpur by Westin takes special requests – add in the next step! Element Kuala Lumpur by Westin accepts these cards and reserves the right to temporarily hold an amount prior to arrival. Please contact the property directly for more information using details from the Booking Confirmation. Yes, my request for soft (1/2) boiled eggs was not perfected during my 4 nights stay. The one supplied on the counter has been sitting for a while which is not warm and too plastic. Location is good. Breakfast is abundantly good esp staff are very service oriented. Tables are cleared asap with friendly smile throughout. Special mention to Manager Doris who took her time to listen & interact with us and to other guests. Cleaning staff very pleasant and give service. I arrived around 9am check in was at 3 pm but they manage to find me a room so I can rest directly from my long trip The room was really spacious with a nice view Everything was really clean I was so tired that I stayed at the hotel for dinner I ordered room service which was really good and not expensive at all The next toning I asked for a breakfast brunch place They recommended the raft-cafe a few minute by walk from the hotel Delicious ! I had to ask for additional hangers twice from the counter but gave up in requesting this as nothing was being achieved. Everything was very good. Staff was friendly and helpful. I was staying for 20 days and the room met my requirements. The kitchenette was handy as was the filtered water tap. I had to use to self laundry. The machine was straight forward the use and didn’t require you to go out your way to buy soap powder and conditioner unlike a neighbouring hotel which I also stayed in which had a complicated washing and drying machine and charged you to get washing powder. The pool was excellent. Shame about the spa which is currently in process of being made. Gym was good too. I hope it stays this way if I was to visit again. I feel like bathrobes should be available in the room by default, but you can request for it through phone. Not a big deal really. I booked the one bedroom suite, the views were exquisite, the Heavenly Mattress the most comfy, and the breakfast amazing! My first and definitely not my last stay here. the coffee machine is not working. Breakfast not good. The female staff who had a haircut like 'Dora the explorer' mistook me for someone else. When I looked at the other guest, he was so so so so so so much oversized than me. Silly to be mistaken. After she left, she never came back. No explanation no sorry. I went to approach her, and she just said 'it's ok. Nvm.' I tried to give her a second chance to apologize rather than abruptly go away, and she just simply 'it's ok' me? Such a shame. We went out late abt 1pm and came back abt 5pm, room not cleaned in spite of putting the sign at the door. Had to call them to come and clean. Upon asking the front desk, Dicklin, if there's an option for upgrade, she immediately offered us free upgrade. Loving her so much. Bed was super awesome. View was great. Big room space and spacious toilet. The water temperature from the shower was unstable, it was either too cold or too hot, we had a difficult time trying to get the right temperature from the shower. Love the view from our room and the buffet breakfast! Other than the Suria KLCC Mall and the Petronas Towers about 800m away, there aren't many tourist facilities in the area. Very good value business style hotel. The looby is on the 40th floor and the rooms occupy floors 41 to 53, so you are guaranteed a good view. The restaurant facilities include a good restaurant, swimming pool and small gym. Maybe a guided tour of what's available for breakfast! 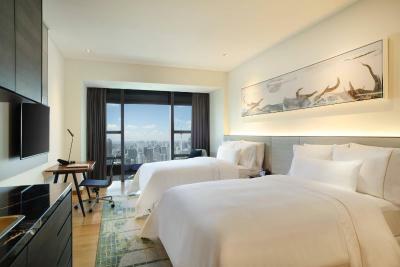 This is a really high quality hotel close to the Petronas twin towers, near to restaurants and shopping areas. The room we were given had an excellent view across to the Kl Tower (we were on the 49th floor) and twin towers and the city skyline. The hotel had everything you need, clean and comfortable large rooms, attentive staff, tea/coffee and drinking water in rooms and a bewildering, extensive, choice for breakfast, roti with chicken curry anybody? Also has a warm swimming pool. All at a very reasonable price. Would definitely recommend this hotel. The suite was huge, perfect for families. Everything was clean, bed was comfortable. The kitchenette was well equipped. Wonderful sunrise view from the room. Great location beside the Ampang Park train station.